Alright. Lords of the Fallen. I, like many other people who talk about this game, am inevitably going to compare this game to Dark Souls, which may seem a little unfair, but it IS an unapologetically blatant Dark Souls clone, so that’s the price it has to pay. There are differences, but the core of the gameplay is exactly the same. High difficulty and you drop all experience you’re carrying if (when) you die. One big difference you’ll notice right away though is the huge lack of class options compared to Dark Souls. There are only warrior, cleric, and rogue classes with almost nothing in the way of specialization for each of the three. You will also notice that the “crafting” system is mostly worthless. It’s really just putting runes into gear slots, which is pretty unhelpful outside of adding status effects to weapons and mostly just leads to you having piles and piles of completely useless runes that you will never use and can’t do anything with. Anyway…I went with a rogue because I didn’t feel like playing a standard tanky guy and who the hell ever wants to play a healer? Don’t expect it to be that easy very often though. You have to advance slowly and carefully because vicious enemies are waiting to ambush you around almost every corner. While this is a challenging game, it definitely is not quite as punishing as Dark Souls. Part of that may be due to me already having played Dark Souls, so I knew how to approach this type of game. It definitely gave you a little more slack though. Checkpoints were not quite as far apart as in Dark Souls. You will almost never have to fight multiple enemies at once, especially with how amazingly bad enemies’ detection of you is. Bosses aren’t generally as difficult either, though there are a few exceptions, like the infamous Worshipper. Something else the game shares with Dark Souls is the almost complete lack of a plot and some really halfassed characters and side quests. Oh look, here’s a wounded guy who needs you to make an important decision for him! Of course, if you don’t save this insignificant-seeming nameless guy’s life he won’t be around later to give you fetch quests that will allow you to permanently upgrade your much needed health potions, because sure, why not. Basically, demons are invading and you need to stop em, bro! That’s all you really need to know about the whole story. Everything else is just confusingly vague or huge cliches. You don’t play a game like this for the story though. You play it for the challenging combat and cool looking environments and enemies, and this game definitely has its fair share of that. Unfortunately, something else this game has its fair share of is bugs. It has an uncomfortable amount of crashing and freezing, which is extra painful in a game like this. There was one boss who just stopped moving halfway through the fight and stood there spasming as I stabbed him to death. I also had several deaths caused by bumps in the floor magically boxing me in so I couldn’t evade at all. Yep. Just magically died the instant I came back to life and lost all my experience. Awesome! Still, despite its flaws, I enjoyed the experience for the most part. Nice graphics, nice combat, and a nice challenge that was a little less ball-punchingly frustrating than Dark Souls (and about half as long too). Many big, tough, and cool looking bosses to fight too, which is always nice. It was a satisfying Dark Souls-ish experience that I would recommend so I give it 4 unexplained bald super-powered face-tattooed prisoners out of 5. 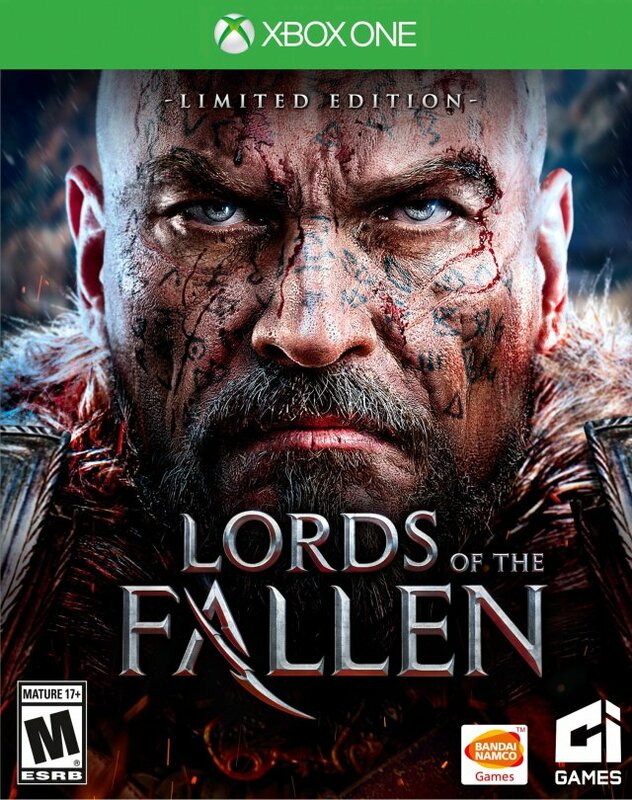 This entry was posted in Games and tagged Games, lords of the fallen, xbox, xbox one.